You don’t have to go far in the knitiverse to hear about “second-sock syndrome,” that phenomenon of great disappointment when, just after you’ve proudly finished an amazing sock, you realize that you have to do it all over again so that you’ll have a pair. I’ve heard knitters gripe about this, or even give up on it altogether…I remember Camden, Maine’s Unique One yarn shop being full of ladies with mismatched hand-knit socks because they just decided to alleviate second-sock syndrome altogether. I tend to treat the second sock a little differently. Take the beloved Hexagon socks, for example. It took me a little over a month to finish the first sock. Granted, I took on a couple of other small projects in the middle (a pair of mittens and some worsted-weight house-socks) but that was largely because I just wanted a break. Well, I finished the first sock recently and I couldn’t be happier. It looks cool, feels great on the foot, and is destined to be the talk of my elementary school once I start wearing the pair to the music classes I teach. Sock 2 just over a week in. So how did I celebrate? 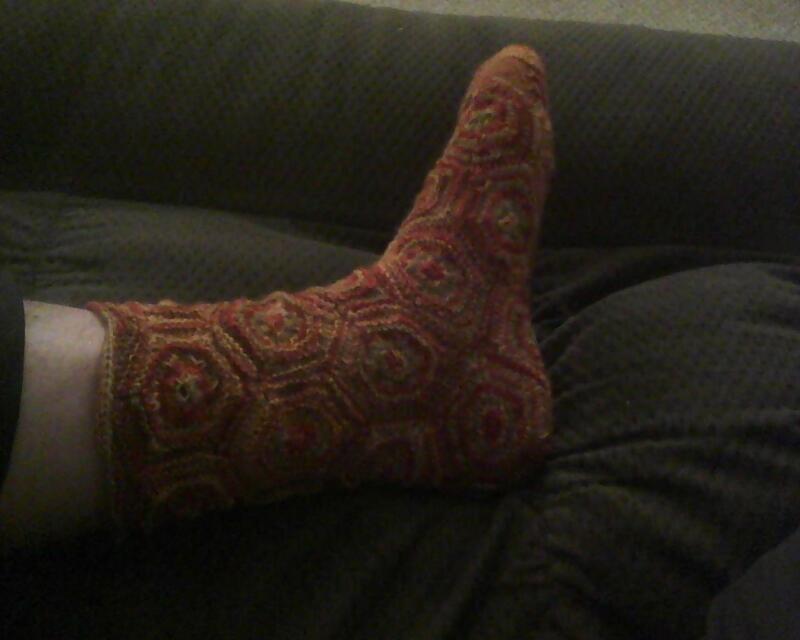 That’s right, by immediately casting on sock #2. Not only did I begin the second sock, but I attacked it with a vengeance. My goal has been to knit at least 2 hexagons per day, but some days I got 3 or 4 done. I spent that month on the first one, but after one week on the second sock I had finished the heel and was plunging into the foot portion. 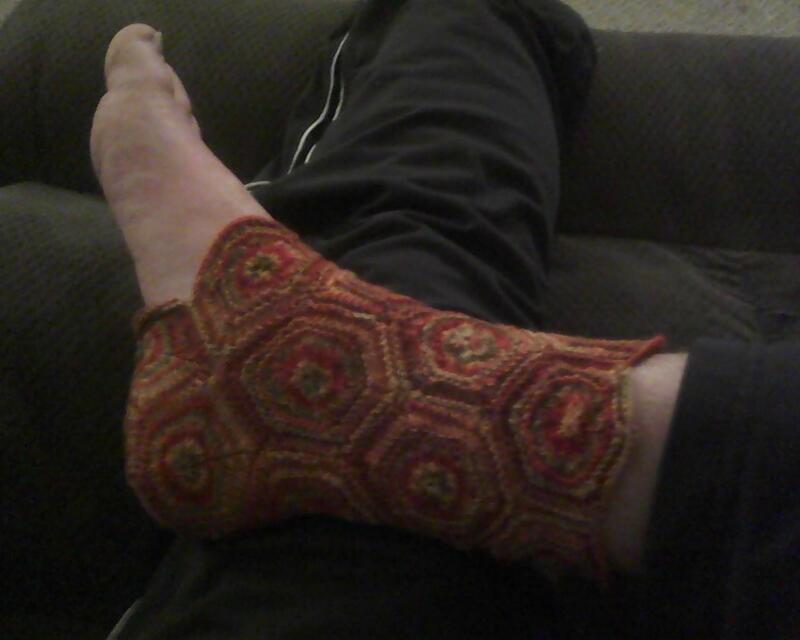 You see, once I get the first sock done and see how amazingly cool it is, I want to wear it. But I don’t do mismatched socks. Besides, even mismatch aficionados would’ve found it hard to find something to wear with this one. So I’m tearing through the second sock with hopes of finishing it this week, even after a very busy weekend that included very little time to knit.